BMW launched its compact hatchback, 1 Series early last month, positioning a great value vehicle targeted at the entry-level consumer in the luxury car market. 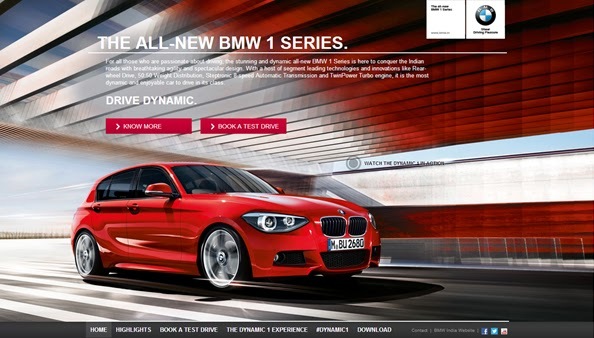 The Dynamic 1 website reinforces the ‘Drive Dynamic’ credo of the new car. The smooth and flowing UI with bottom navigation lets users move seamlessly between sections. Full screen auto-adjusting imagery amplifies the visual impact of key features, videos and launch event pictures displayed on the website. The site also captures #dynamic1 hashtag twitter feed. The site is well put together and leaves a visual impression befitting an aspirational brand that thrives on design. The BMW India YouTube Channel experience ties-in very well with the brand website and features videos from the Dynamic 1 Contest Winners' Meet & Greet with Sachin Tendulkar (the brand ambassador) in Germany. BMW India of course executed their favourite YouTube Video Masthead ad-unit to promote the new launch.